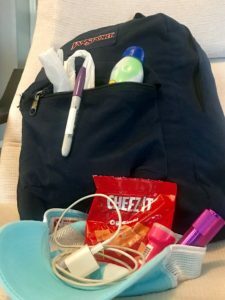 Producer: What’s in my Bag? At L.A.M.P. Media I need a bag packed for wide range of productions. From movie sets to a social media video shoot, it is typically packed the same. I show up prepared. For many years I trusted my navy blue JanSport backpack. I bought it just before starting film school at the University of Miami and used it for many years since. Thanks to my husband & business partner, I now have a grown-up JanSport bag. [This is where I add a link to JanSport. They did not pay me to do so, sadly]. FYI, I kept the navy blue bag too. Always good to have a backup. (That’s an overall production tip). ITEM 1.Plastic Shopping Bag (or two, remember I like backups). Purpose: Waterproofing, protect laptop, contain stinky items, extra bag for carrying things, etc. A tip I learned while growing up in Florida, pack a bag (in your bag). A simple plastic shopping bag can make instant waterproofing, an extra tote, or a garbage bag. For interior waterproofing, be sure to cover items with the opening of the bag facing downward. Otherwise, you are in for a bag of water with treasured belongings in a bath. You can buy a fancy waterproof backpack. I still would toss a plastic shopping bag, for its many uses. ITEM 2. 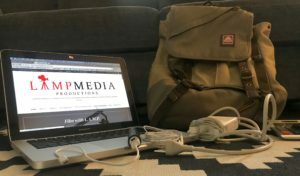 MacBook Pro Laptop with charger. Purpose: My office is anywhere I am. ITEM 3. Smart phone with charger. ITEM 4. Extra wireless battery with mini USB charger. Side note, the people with the extra chargers and cords are always popular. I don’t spend a lot of money as they often go unreturned. So again be prepared or pack 2. And always charge the night before a shoot. ITEM 5: Ear Buds and wireless headset. These days I make sure I have a wireless head set for driving. ITEM 6: USB Car Adapter. Don’t just assume the rental car or truck will have USB slots. Also the driver may have their devices charging in the USB(s). On those long days (and nights) it helps to have a good ole’ calculator for quick math and double-checking figures. This is something many producers may not have. When first shooting our documentary, it was just Andrew & I often. Andrew shoots and Gaff, I assist and produce. Our jobs frequently require a small crew so I wear many “hats”. Having a backup has been helpful for. Getting “the shot” is always the most important aspect of filming, no matter the size project (aside from safety), so I make sure I have a back up lens pen handy. Clean lens equals clean shot. ITEM 10: Wallet & pouch for petty cash. Tip: keeping petty cash separate with a place for receipts and change is advised for keeping organized. ITEM 11: Pens & sharpies. Must have sharpies! Production Assistants listen up, you will always need sharpies. Take a note write a name of that (much needed) cup of coffee, update a call time for your crew. The uses never end. Always be prepared. ITEMS 12 & 13: Baseball cap and sunscreen. Baseball cap will protect you from the sun. It will also keep pouring rain out of your eyes. I learned this in my early days as a production assistant while working on an episode of Law & Order: SVU. The weather forecasters were tracking a tropical storm; it was headed right for us. We filmed anyway. I did not yet have good production rain gear, but I had a hat and yellow slicker overalls with a matching jacket (from a nearby store). I looked like a kid dressed up as the fisherman on the side of the fish stick box (without the beard). But I had my hat and my new outfit to keep the stinging rain at bay. I remember getting Coco (Ice-T’s wife) a sandwich from the Craft Services Truck in my very cool outfit. She was grateful; the sandwich was dry-ish, thanks to my overalls. If I were still in New York I would have an extra winter hat in the winter, lightweight rain gear, and spare socks and T-shirt in the summer. There is nothing worse than wet feet and cold ears all day. ITEMS 14 & 15: Travel toothbrush set and deodorant. Sometimes there is nothing more satisfying than a fresh up at hour 14. I rarely hang out near crafty and may need to be on the move. So I like to keep a granola bar handy. During my two pregencies I worked into my third trimesters. For the first (Livi), I was a free-lance producer in New York. I worked on a commercial for 4-H Club that summer. My snacks (and water) became more valuable to me than my computer. One trip to a unlit port-a-john in the dark of night was all it took to add this to my kit the following day. This is useful for the obvious and also great for double checking that lens!